Like many other women, I love when I have the opportunity to take care of my nails and make them look amazing. Most of the time I have to do it myself since I refuse to pay the cost of getting my nails professionally done. On top of that, I don’t like the polishes used in most salons since they are filled with chemicals you really don’t want touching food. Since its hard for me to find nail polish that meets my expectations, I usually just file my nails and call it a day. Recently, however, I learned about an all natural brand of natural nail polishes – GLOSS Naturals. 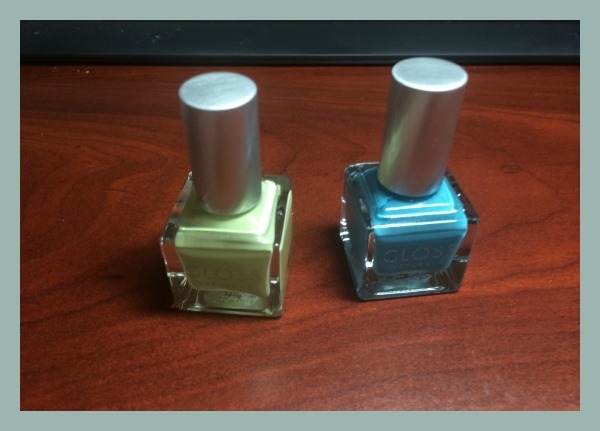 Curious, I reached out to the company, who asked me to review two of their beautiful summer colored nail polishes. Looking for an eco-friendly nail polish? If so, we think you will love GLOSS Naturals. 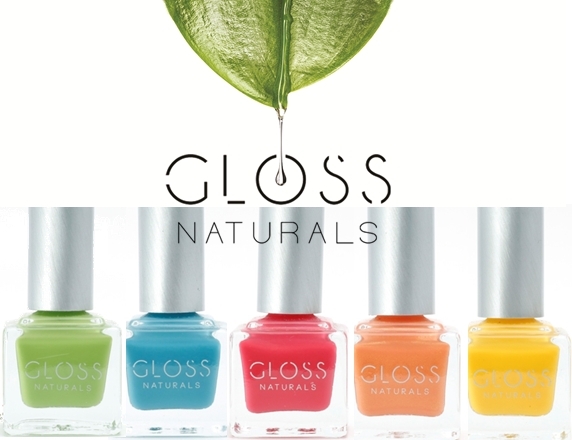 Launched in December of 2013, GLOSS Naturals has made a variety of products that are all preservative free, including over 100 different nail lacquers, nail treatments, body lotions, sugar scrubs, soy-based polish removers and body mists. All of their nail polishes are also completely vegan, never tested on animals, and the bottles are completely recycled, made from recycled glass and other materials. Since they are eco-friendly and designed to be child safe, they are one of the few nail polishes safe for expecting mothers. With variety of wonderful colors, you can find the perfect nail polish for any outfit! Having tried some natural nail polishes in the past, I can honestly say I did not have very high expectations. Most of them are difficult to put on, watery, and chip if you happen to look on your nails the wrong way. From previous experience I expected GLOSS Naturals to be like the others – I was wrong. This nail polish has to be some of the highest quality nail polish I have tried in a very long time. Even after typing away, it still looks perfect. Not only does it behave during the applying process, but easily washes off skin and dries fast. Really, it is the perfect nail polish for any busy woman who wants to make sure her nail products are not just the best, but chemically safe. Based on my own experience with GLOSS Naturals, I am happy to give these products an A+ rating! Want to buy some of these wonderful nail polishes for yourself? You can purchase GLOSS Naturals nail polishes, Base/Top Coat, and other nail retailers products from $10.90 – $11.75 a bottle on their website. I am not usually one to do my nails other than a cut and file, and occasionally I push back the cuticles. 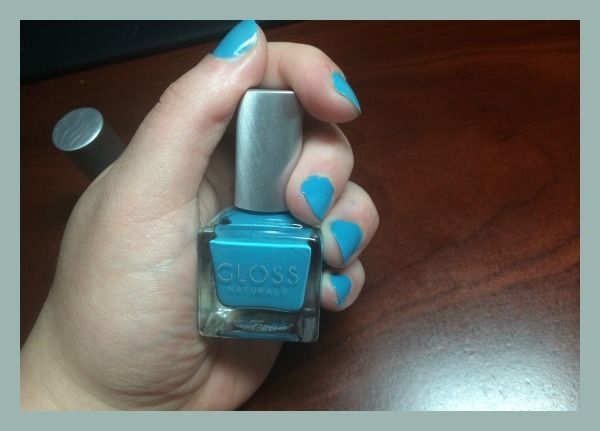 However, I lOVE the blue you have on your nails so I may just give the GLOSS a try! Those are nice colors for spring.I too will not pay for a manicure. I’ve used a gel nail kit at home and I’m not too happy with it. The color chips after a day or two. I’d like to try this. The middle color is adorable. Unfortunately, I have the problem of collecting nail polish and hardly ever using it. Eco-friendly? Yes, please. I’m not usually one to paint my nails, but I just might have to give this a try! I normally don’t either – mostly because I HATE the smell of nail polish and worry if breathing it is really ok, you know? This stuff is great! i love the colors that they have and the fact it is eco friendly. i try to do what i can for the planet and this would be great if it looks as good and lasts. I didn’t even know that eco-friendly nail polish was possible. Perhaps when I have some extra money I’ll have to give them a try. Love the colors they have and love how they are eco-friendly!! They are also fairly prices so you can’t go wrong buying these nail polishes!! Hmm, thanks for a great review. My daughter loves to paint her nails but I hate buying the cheap stuff. May have to look into getting some of this! Great! It is exciting to hear that you found a good, natural one. My daughter loves nail polish but between chemicals and ones that chip or don’t go on evenly, it often feels like a waste of money. These are beautiful colors and the blue looks wonderful on you. The shade and coverage are even and very nice looking. This sounds like really great nail polish. Thank you for your review. This stuff sounds great! I would love to give them a try. Thanks! I honestly did not even know there were eco friendly polishes! The colors look great! I can’t seem to find what is actually in the nail polish. Everything I find says what is not in it. Is there an ingredient list available? Thank you so much! This nail polish sounds like a great option!